I was born in San Antonio, graduated high school in Dallas, received my business degree from The University of Texas and my juris doctorate from Texas Tech University School of Law. Before law school I worked for the I.R.S. in Austin and the F.D.I.C. in Houston. 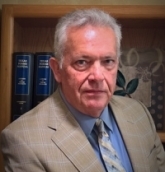 Upon graduating from law school, my wife and I moved to Las Cruces, New Mexico where I practiced law for 32 years, helping families in both New Mexico and Texas with estate, financial and business planning and other legal matters. I am a member of WealthCounsel, a national affiliation of estate and business succession attorneys. I participate in legal education programs at which WealthCounsel members, including attorneys, accountants and financial planners, share cutting edge planning tools and techniques. While my wife and I enjoyed the wonderful people and beautiful landscapes of New Mexico, we had always planned to return to our Texas roots at some point. After the kids left the nest (and landed in Texas), we felt the pull of the Texas hill country and decided the time was right. So here I am, re-established in the heart of the Texas hill country, eager to get to know new friends, neighbors and clients.